We have extensive experience in HTML, XHTML, XML, CSS, Java Script and web programming platforms ASP & PHP. We have worked extensively on databases solutions on both SQL and my SQL. We are constantly aiming to future proof our web projects, and as such we work with the latest technologies such as AJAX, SOAP, Ruby on rails and pure XML to create efficient web projects. We comply with WC3 guidelines on HTML, which means the sites we design are technically, sound and deliver results. We also have a very strong foothold on Joomla based websites and have done over 200 Joomla sites. You name the kind of site you need in Joomla, and you have it! If we are not able to deliver that, you have 200% of the payment back. This is a challenge! Are you ready to try us? 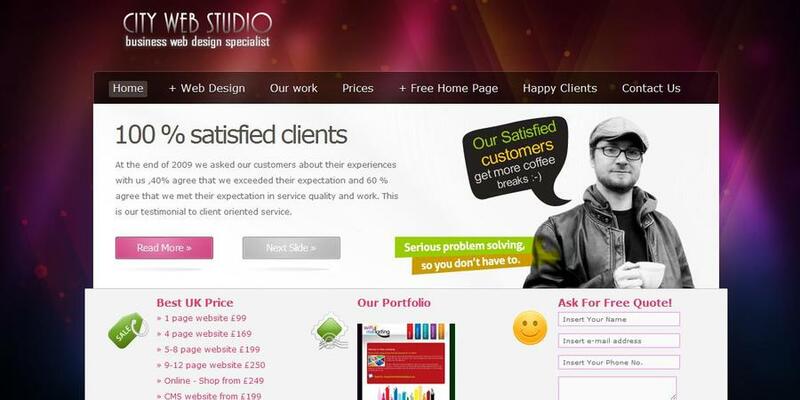 CityWebStudio, best websites at the lowest possible prices.